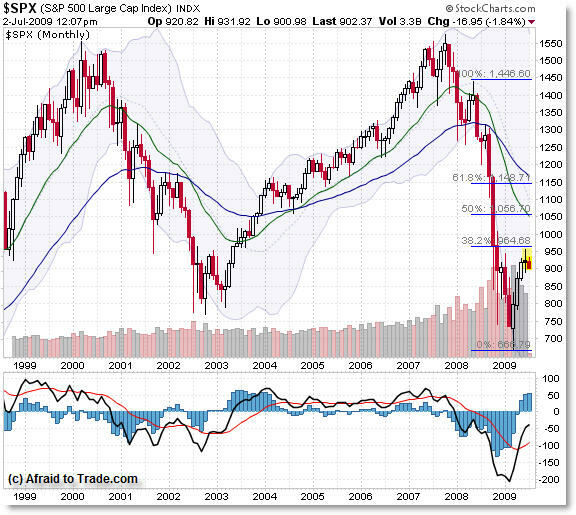 Sell Signal on SP500 Monthly Chart? June’s monthly candle closed with a ‘doji’ at Fibonacci resistance – that’s a bearish development as we start the new month of July. Let’s take a look at the S&P 500 monthly chart to see its current structure. We see the S&P 500 is still below levels from 1998 – in fact, price recently came into the 950 level which was prior support in late 1998 (and for the September spike-down in 2001). Most importantly, we have come into the 38.2% Fibonacci resistance level of the May 2008 highs to the March 2009 lows – virtually to the point. In combination with that, we have a bearish doji candle formation at overhead resistance – and as of June 2nd, we have a down-candle. Don’t put so much emphasis on the two trading days in July as equal to the full months the other candles represent – but it’s telling. If price continues in the direction it appears to be traveling (down), then we will have a confirmed reversal/retracement down off the 950 highs in mid-June.